In a landmark study of over 50,000 hospital admissions, investigators demonstrated the feasibility of introducing universal screening for alcohol misuse to identify patients at risk. They showed that patients can be easily categorized based on a simple risk score to identify people with high rates of emergency department attendance, recurrent hospital admissions, and high risk of alcohol-related liver disease. These patients can be selectively targeted with effective treatments for alcohol misuse, potentially reducing the burden of alcohol-related harm including alcoholic liver disease (ALD). The findings of this study are published in the Journal of Hepatology. “Many people who die from alcoholic liver disease have a history of alcohol misuse and recurrent hospital admissions, each representing a potential missed opportunity for effective intervention,” explained lead investigator Richard Aspinall, MBChB, PhD, consultant hepatologist from Portsmouth Hospitals NHS Trust, U.K.
Alcohol misuse is one of the three leading causes of preventable death from non-communicable diseases worldwide. ALD is one of the main causes of alcohol-related deaths and disability. In fact, ALD is the most common cause of death from liver cirrhosis and is estimated to be responsible for nearly half a million deaths and the loss of over 14 million disability-adjusted life years per year globally. Europe is the heaviest drinking region in the world in terms of the prevalence of alcohol consumption according to the World Health Organization. Deaths from alcoholic liver cirrhosis have fallen in many European countries, but they have increased in England and Wales, where it is predicted more than 200,000 people will die of alcohol-attributable illness over the next 20 years. Universal screening for alcohol misuse has been advocated in the past, but its feasibility has been questioned. Several prior studies have shown that only a minority of hospital inpatients are screened for evidence of alcohol misuse and too few patients are referred for treatment of alcohol dependency. This study demonstrates that both of these issues can be effectively addressed. Between July 2011 and March 2014, investigators systematically screened all admissions to the Acute Medical Unit (AMU) of a large acute hospital in the U.K. using an electronic data capture system in real time. During the collection of vital signs on admission to the hospital, the modified electronic version of the Paddington Alcohol Test (mePAT) prompted the admitting nurse to record type of alcohol consumed, frequency, and maximum daily amount, whether the admission was considered alcohol-related and document signs of alcohol withdrawal. Additional data were recorded on admission diagnoses, alcohol unit consumption, previous attendances, previous admissions, length of stay, and mortality. Prevalence of primary diagnosis groups among screened AMU admissions (selection of most frequent diagnoses amongst high risk admissions). Two to three percent of admissions were classified at “increasing,” and four percent at “high” risk of alcohol harm. 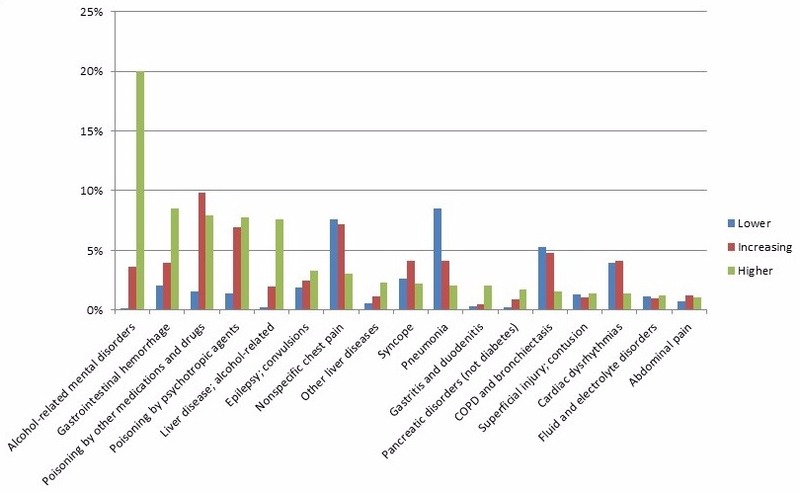 Compared to the other groups, high risk patients had a distinct profile of admissions with the most common diagnoses being mental health disorders, gastrointestinal bleeding, poisoning, and liver disease. Patients at increasing risk of alcohol harm were referred for either brief intervention or further assessment by an Alcohol Specialist Nursing Service. “Our study shows that universal screening for alcohol misuse among patients admitted to Acute Medical Units is both achievable and can help target interventions,” commented Dr Aspinall. “By classifying patients according to their risk of alcohol harm, we can ensure they receive the appropriate therapies that will potentially reduce the risk of further adverse events in future. In an accompanying editorial, experts note that this study describes an acceptable, effective, feasible, and sustainable method for screening acute medical admissions for evidence of alcohol use disorders. However, they caution that there are challenges in moving beyond identification of patients at risk to implementing effective treatment, especially in the context of healthcare systems already operating at the limit of their resources. “An estimated 1,000 patients per year were identified by screening, half of which were referred to inpatient services. If replicated elsewhere, this workload would likely overwhelm the capacity of the majority of alcohol services,” noted Stephen R. Atkinson, MBBS, Department of Hepatology, Division of Surgery and Cancer, Imperial College London, U.K. The articles are “Universal Screening for Alcohol Misuse in Acute Medical Admissions Is Feasible and Identifies Patients at Risk of Liver Disease,” by Greta Westwood, PhD; Paul Meredith, PhD; Susan Atkins, RN; Peter Greengross, FFPH; Paul E. Schmidt, MRCP; and Richard J. Aspinall, MBChB, PhD (http://dx.doi.org/10.1016/j.jhep.2017.04.017), and “Editorial: Universal Screening of Acute Medical Admissions for Excess Alcohol Consumption: What's the Misuse?” by Stephen R. Atkinson; Nikhil Vergis; Alexandre Louvet, MD, PhD; and Mark R. Thursz (http://dx.doi.org/10.1016/j.jhep.2017.06.006). They will appear in the Journal of Hepatology, volume 67, issue 3 (September 2017) published by Elsevier. Full text of these articles is available to credentialed journalists upon request; contact Sybrand Boer Iwema at +31 20 485 2781 or hmsmedia@elsevier.com. Journalists wishing to interview the study authors should contact Allison Stratford, Communications Director, Portsmouth Hospitals NHS Trust, at Allison.Stratford@porthosp.nhs.uk. Journalists wishing to reach the editorial’s authors for comment should contact Alexandre Louvet at Alexandre.LOUVET@CHRU-LILLE.FR. For questions concerning the Journal of Hepatology, please contact Editor-in-Chief Rajiv Jalan at hmsmedia@elsevier.com.